THE ORDER OF the Sacred Heart nuns arrived in Ireland in 1922 within months of the formation of the Irish Free state after the civil war. They were invited over from England by the newly-formed Irish government to deal with the ‘problem’ of women having babies outside wedlock. They bought a 200 acre farm in Bessborough, county Cork and began operating a Mother and Baby home. They later expanded and bought Conville House and grounds in Roscrea which they renamed Sean Ross Abbey. In late-1933 or early-1934, they bought the third and last of their homes; the old Manor House in Castlepollard, county Westmeath with 110 acres of land. They built St Peters, a three-storey, 120-bed maternity hospital between 1935 and 1937. It was designed by TJ Cullen (1879-1947). They received a grant of £65,000 from the government (a huge sum of money at the time) from the Hospital Fund which was the Fund for profits from the old Irish Sweepstakes. It remains the only custom built Mother & Baby home. They also added a medium-sized chapel, St Josephs, between the Manor house and hospital. Designed and built by Cullen (who also designed and built the Chapel at Sean Ross Abbey), it cost £11,000 of the Order’s own money. The number of residents declined completely from 1969 through 1970 and finally sold the entire place to the government through the Eastern Health Board in 1971. During its 35 years as a maternity hospital, Castlepollard never employed a doctor or any nurses. There was just one midwife at a time as was absolutely required under the 1934 Registration of Maternity Homes Act. It was the bare minimum. At least one of those, Nurse Smith, had a very mixed reputation; some speaking well of her and others hating her intensely. The Local Authorities paid the nuns a weekly ‘Capitation Grant’ paid from the county where the girl was from. At one time, it was 16 shillings per mother per week and later £1, and 2 shillings and 6 pence per baby/child, for their care. The nuns did not waste money on luxuries such as medical equipment, painkilling drugs, gas and air, etc. Babies were kept in large rooms or wards on the ground floor while mothers stayed on the second floor in dormitories housing anywhere from six to 12 women, depending on how many were held at any one time. The third floor had two large rooms at the back where all the births took place with mums and newborn babies remaining on the third floor for a couple of weeks after the birth. The third floor also had a few ‘private’ rooms where well-off families who could afford to pay handed over the huge sum of £100 for privacy and a speedy exit. There was a small standalone room built in the middle of the back lawn that served as a delivery room of sorts. Since no screaming was allowed during labour as part of the punishment, any girl who couldn’t help screaming was put out into the outside delivery room. It is nicknamed the ‘Screaming room’. They were often in and out in as little as five or six weeks. During its time, 3,763 babies were born and had their births registered. All were baptised within days of their birth in the Font in the Chapel. Nobody knows how many more died but best estimates are between 400 and 500. The babies are buried in a small Angels’ Plot down a laneway, about a quarter of a mile from the Manor house. Local tradition has it that the workmen who dug the small graves hammered a homemade nail into the granite wall for every baby that was interred. It is now known that babies who died were buried in shoeboxes. Oddly enough, Castlepollard started out well. This was because of several factors: the recent introduction of the 1934 Registration of Maternity Homes Act and the fact the government paid for the Hospital were important. However, neither compares with the fact that the new head of the entire Sacred Heart order, Mother Superior General Lawrence, had once been just Mary Daly from Westmeath. It seems Lawrence did not want a M&B with a reputation as a hellhole in her backyard – where her family still lived. It might also be a factor that the rules of the Sacred Hearts required Daly to visit every single Home under her control once a year in the UK and Ireland so it was convenient for home visits too. There were about 15 to 20 nuns at the beginning and they ran a tight ship. They had huge, expensive ledgers specially printed to comply with the letter of the law under the new ROMH Act. They still exist and are in good condition. Lawrence died in 1941 and, although I can find no record of it, it’s likely she didn’t visit for a couple of years before her death due to a combination of the restrictions on travel due to the War (1939 to 1945) and her age. Mortality rates in the first years of Castlepollard’s existence were barely above the national average. But within a few years of Mother Lawrence’s death, mortality rates went up and Castlepollard began to gain a harder reputation (although never as bad as Sean Ross Abbey). In fact, girls in Castlepollard were threatened with being transferred to Sean Ross if they didn’t toe the line and behave themselves. Expectant mothers nearly always arrived with their mothers and carrying a letter of reference from their local parish priest. Mostly they came by bus and stopped outside the Castlepollard Hotel which still stands. Occasionally, trusted girls from the home were sent over to meet new arrivals off the bus – if they were unaccompanied – in case they did a runner or stayed on the bus. They were given ‘house names’ upon arrival and provided with a rough cloth, shapeless uniform, drawstring underwear, and hard clogs. Bras were not allowed. The girls were not allowed to talk to each other or form friendships. They were underfed and undernourished and forced to do hard work as ‘penance’. They remained for two years on average, working on the farm or in the laundry or cleaning and scrubbing floors. They picked fruit and made jam, anything to ‘repay the debt’ the owed for their care. Many stayed for three to four years. Days began early with prayers coming from a tinny loudspeaker system during the 1960s, while the girls washed and dressed followed by daily mass with fire and brimstone sermons from the local priests, particularly Father PJ Reagan. Girls sat at the back of the chapel and the nuns entered from the corridor from the Manor house. Girls would faint at mass and were punished for their ‘disrespect’. Father Reagan was heavily involved with the adoptions, particularly foreign adoptions to America; he also ran the Saint Claire’s Adoption Society which also handled adoptions from Saint Clares in nearby Stamullen – a huge ‘Holding Centre’ for unaccompanied babies and children. Reagan also had some involvement with another M&B home named Ard Mhurie in Dunboyne, county Meath. Girls who ran away were quickly recaptured by the local Garda and returned. They were locked into a room on the ground floor as punishment. The local Garda station is directly across the road from the front entrance to the M&B home. The nuns solicited “donations” from natural and adoptive families and profited greatly from running a farm with free labour. They also operated a small hand laundry and if they could find any small local contracts, they’d grab them. The little chapel saw at least 15 marriages over the years. If a boyfriend of one of the girls showed up, Reverend Mother Rosamund McCarty would famously say; “Right! No time like the present!”, send for Father Reagan or any local priest, and have the couple married at once. After a cup of tea and a slice of cake, the happy couple would be shown the door. A total of 278 babies born during the period 1948 to 1973 were sent to America. They are known as the Banished Babies. There are also six Castlepollard children listed as test subjects in the Borris-Wellcome vaccine trials. As far as is known, the nuns burned almost every record when they left. In fairness, it should be pointed out that this was a tradition in Ireland and worldwide at the time. People in the countryside simply burned their rubbish every so often. It was also the norm when moving property. When the nuns left Castlepollard in 1970, they burned almost everything but the bare adoption files and the four main ledgers. This is all that is left as the sum total of the lives of the almost 8,000 mothers and babies who passed through. Personal letters, financial records, all of it – up in smoke. All surviving records are now held by the HSE South. St Peters is now used as a residential centre for adults with learning difficulties. The nuns did exactly the same in Sean Ross Abbey when it closed in 1970. In the early 1990s (at about the same time as the Irish public was learning about the child abuse scandals and the horror of the Industrial schools), the Sacred Heart nuns sent money to the Department of Health staff running Castlepollard, to have the Angels’ Plot cleaned up. They also arranged for a small memorial stone to be erected. 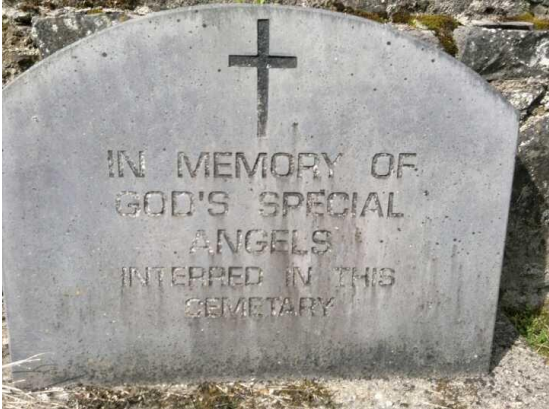 It is made of cheap limestone, weathers badly and the last word on the stone ‘cemetery’, is misspelled as ‘cemetary’. 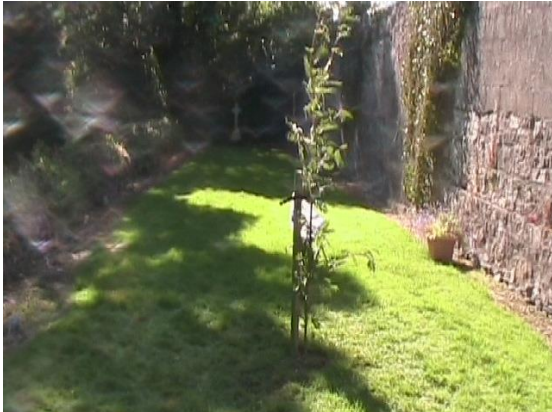 St Peters became a residential center for adults with learning difficulties in 1997 and they began to receive people from an Institution in nearby Mullingar. It is presently being run down in favour of care in the community and there are only a handful of residents left in a few rooms on the ground floor at the far end past the kitchens. Paul Redmond was born in Castlepollard Mother & Baby home and adopted at 17 days old. He has founded several activist or support groups and campaigns for justice for survivors of forced adoption and institutional abuse. He also researches and writes extensively about the history of M&B homes.